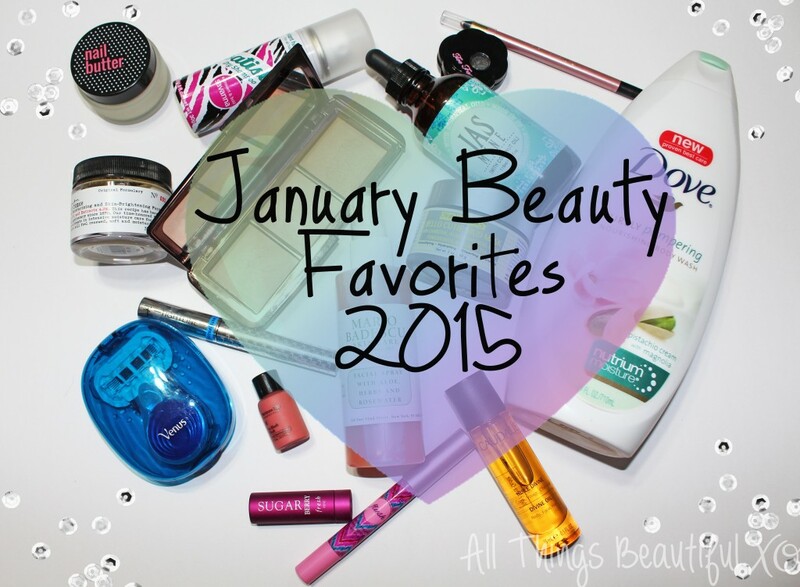 Each year when I pull together my January Beauty Favorites they are mainly about ease of use. Because IMATS LA has been in January the past few years most of my products are geared towards travel! This year, however, I spent half my month there & nearly half my January back here at home. Sick as a dog. Like so sick. It was awful. So prepare yourself for a mix of travel-friendly items & I’m-so-sick-why-is-this-happening products as well! Let me start off with some of the best favorites of the month- the ones a sick person doesn’t take for granted. This Nail Butter has been a lifesaver for my nails & cuticles! Although the scent is beautiful & natural I am all about what it has been doing for my hands! & elbows! From Nail Butter- “used to strengthen and rejuvenate nails by enhancing growth and maintaining optimal moisture levels for your nails and skin“. Yes. The CO Bigelow Lemon Body Cream (this is a smaller jar than the jumbo obviously!) has also been my moisturizing buddy. When I’m sick I really have to be careful with scents & this soft lemon isn’t to sharp or sweet. 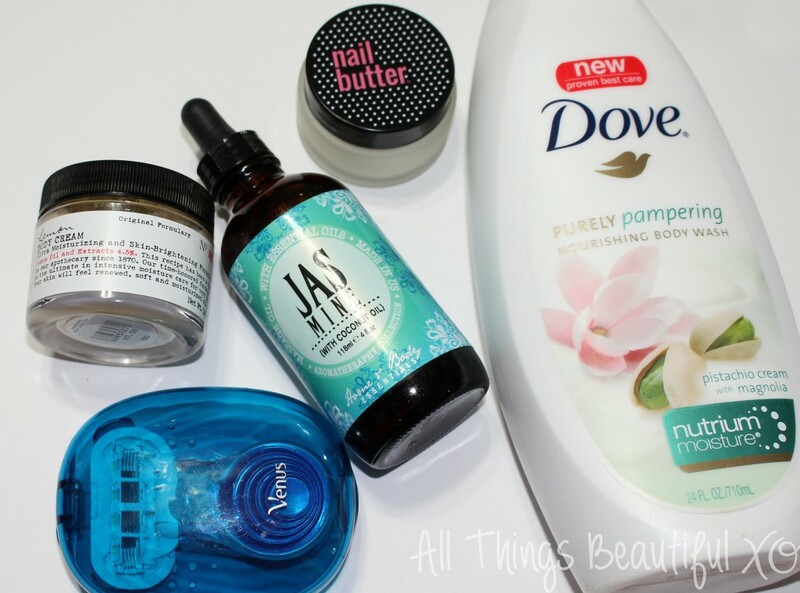 Moving into the bath/shower we have three products- & all of them are must-haves! This Dove Purely Pampering Nourishing Body Wash in Pistachio Cream with Magnolia is luxe & a bargain all at once. I love how moisturizing it is & the scent is girly without being too overwhelming. When I’m sick I tend to take lots of baths to clean relax my aches & pains so this Jasmine with Coconut Oil from Home & Body Essentials has been lovely! I am a sucker for jasmine as I say…like all the time but this company is also based out of my hometown of Huntington Beach, California! Last is the Gillette Venus Snap with Embrace Women’s Razor which you might think looks too dinky to be effective…& you’d be wrong. I bought this right before my trip & it was just as easy to use as a full size! Great little invention & a must-have if you travel. Let’s look at some skin & hair now shall we? If you caught my Face Favorites for 2014 post then you won’t be surprised to see the Mario Badescu Facial Spray with Aloe, Herbs, & Rosewater because I could talk about this all day. I took a travel size with my out to California & used it multiple times a day to stay looking on point. The Caudalie Divine Oil is another holy grail item I always travel with- this is a small size that I refill for travel as well. I used this oil on my hair, body, cuticles, wherever I think of at the time. I even use this to remove makeup at the end of a hard day because the scent makes me exceptionally happy. Batiste Dry Shampoo– it just wouldn’t be a trip without a mini can of this. I like all of their varieties & they all work great for me between washes or for extra oomph. This Glam Essentials Hello Cutie Mud Mask is awesome for my skin when I’m not feeling so well because I tend to really break out. The charcoal really helps clear my pores while the hyaluronic acid helps hydrate. Essential for my combo skin! 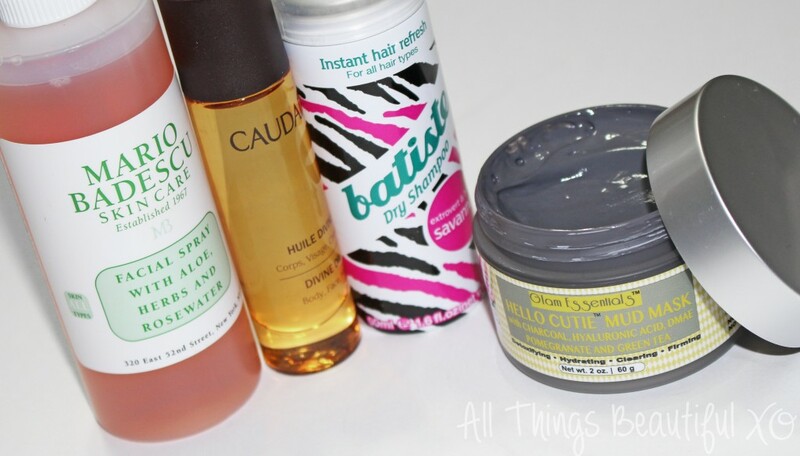 Beauty products for me this month were easy to apply & effective. My favorite eyeliner was the L’Oreal Silkissime Eyeliner in Highlighter. This soft shade really brings light to my eyes in the waterline making me appear more awake & cheery. Even when I needed another 5+ hours of sleep…fake it till you make it! The Fresh Sugar Tinted Lip Treatment in Berry is probably my favorite I own from the line…even though mine got a bit melted. Sad face. 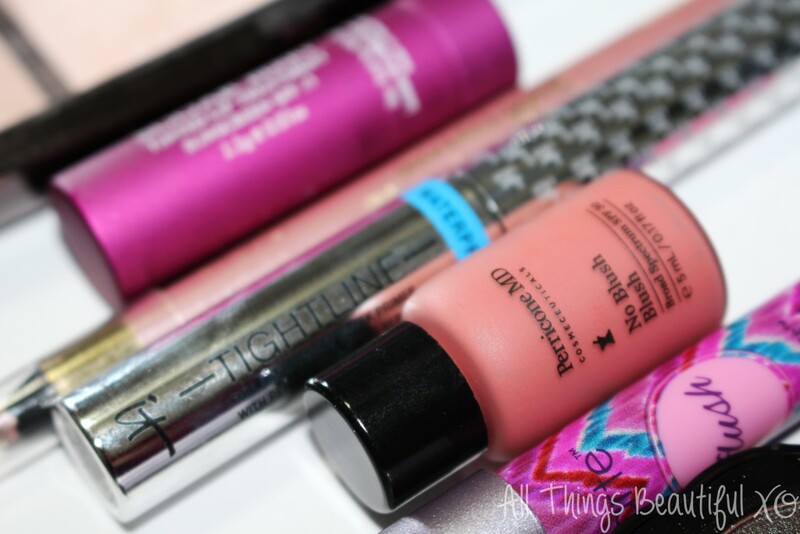 It has an SPF of 15 & gives off such a gorgeous color that goes with everything while being comfortable. 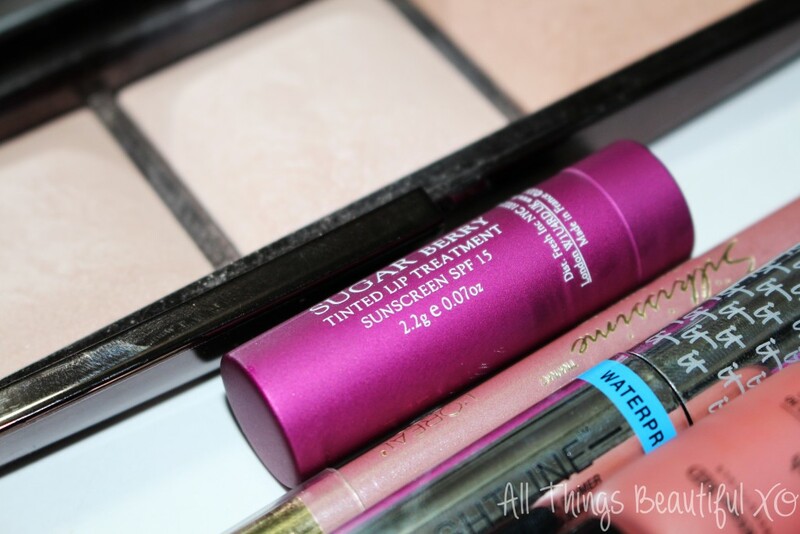 The Hourglass Ambient Lighting Palette is basically in every favorites lately- sorry. But she is a wonder & contains the shades Dim Light, Incandescent Light, & Radiant Light. All of them are stunners. When I got home & didn’t want to look so dry this Perricone MD No Blush Blush was pretty awesome. As in pretty & awesome. I’m still testing it out (& this is a mini) but so far I am loving the natural color & easy application. The It Cosmetics Tightline Waterproof Full Lash Length Black Mascara Primer is a super long name…but it is worth it! It has a tinnnnnyyy brush that won’t budge or flake to coat lashes for a natural look or get right to the roots of my blonde lashes. This Tarte LipSurgence Power Pigment in Flush & I am having a serious moment. I bought this shade & actually gave it to both my mom & aunt as well- the color is that gorgeous. My aunt rarely wears makeup & this even converted her! Flush is a gorgeous berry-toned pink that can do no wrong. Last is my eyeshadow that turned heads like crazy! 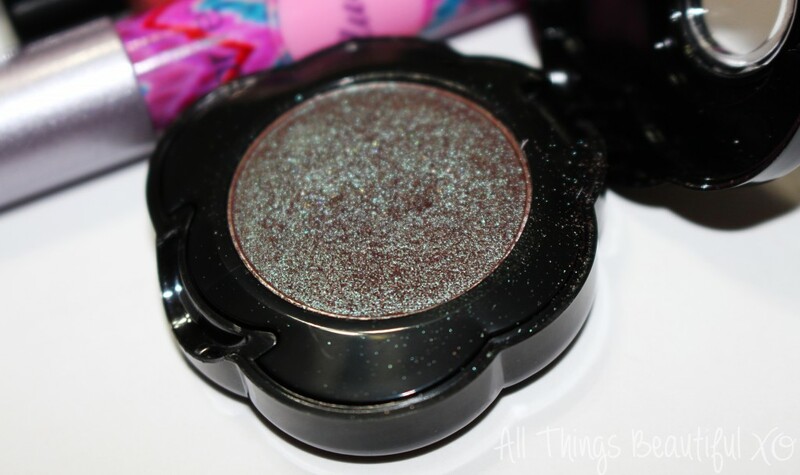 I picked up the Too Faced Exotic Color Intense Eye Shadow in Petals to the Metal while I was there & I’m so glad I did. The photo above is from my Instagram when I was in California & I loveddd this eye look that I’ve recreated it several times since! This shade range isn’t available from ULTA or Sephora anymore which has me concerned…but I did find it for a fraction of the price on Amazon! That’s a great deal! This shade is kind of a duochrome red-toned brown with blue shimmer/sparkle. & you probably need it in your life.